If even as many buddhas, blessed ones as there are grains of sand in forty-eight Ganges rivers are unable to express the mass of merit of the one writing it out, what need is there to mention that whoever writes it out or reflects on it or reads it will become a treasury of the Dharma? The Prajnaparamita Sutra contains the highest teachings of the Buddha and is among the most precious texts available in the world today. Due to the power of this text, writing it out is a way to generate tremendous merit and receive blessings. According to Lama Zopa Rinpoche, one of the main ways to create the causes needed to build the Maitreya Buddha statue in India, is to write out the Prajnaparamita Sutra in pure gold. The completed sutra will be enshrined in the heart of the statue. The Prajnaparamita Project provides the material resources needed to support the efforts to write out this precious text. 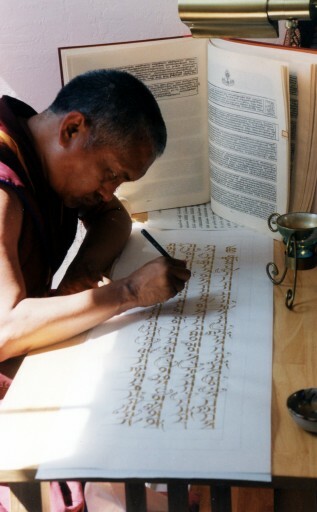 Lama Zopa Rinpoche has been writing the 8,000 verse Prajnaparamita Sutra in pure gold for several years. 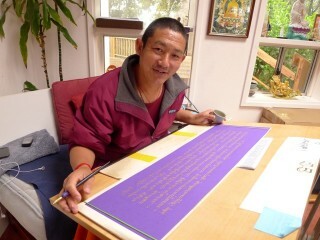 Under Rinpoche’s guidance several students have been writing out the Prajnaparamita on archival quality rainbow paper. Ven. Tsering, a Kopan monk, and Jane Seidlitz, a long-time student, are writing out the 12,000 verse Prajnaparamita in pure gold. In 2013 Ven. Tsering was interviewed about his eleven years working on this project. Among many inspiring remarks, Ven. Tsering commented, “….having one project you receive from your guru, you take it as your project and carry on. Then if you have an attitude like that, I think that is one reason to be able to carry on.” You can read more of Ven. Tsering’s interview here. The benefits that come from writing out sutras such as the Prajnaparamita are extensive. Ven. 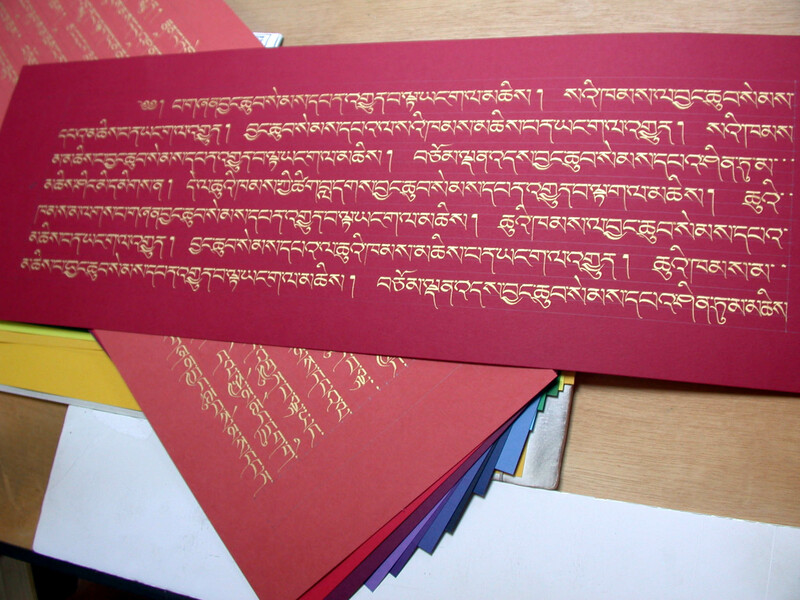 Tsering has been writing out the 12,000 verse Prajnaparamita in pure gold for thirteen consecutive years. If the whole of the great three thousand worlds were completely, entirely filled with stupas, the size of Mt Meru, made of the seven types of jewels, comparing to that, if one writes the Prajnaparimita, in the duration of a finger snap, at least, one achieves the patience of the profound Dharma – great inconceivable exhalted merits. To clarify, one universe of one thousand world systems is a great thousand world; one thousand great thousand worlds is a great two thousand universe or world, while one thousand of these (great two thousand worlds) is a great three thousand world. One stupa directs the mind to Enlightenment and creates inconceivable merit, and with that merit, one can meditate on emptiness without fear. Money from this fund is also used for writing out the Arya Sanghata and Vajra Cutter Sutras in pure gold and silver, dedicated to the completion of the Maitreya Buddha statues for world peace. To read Lama Zopa Rinpoche’s explanation of the benefits of hearing, reading and writing out the Sanghata Sutra. Sutras are records of teachings given by the historical Buddha, Shakyamuni. The Buddha’s discourses were memorized by his disciples and later written down in various languages, the most complete collections of teachings being in Pali and Sanskrit. More…. We are inviting individuals to generate merit and receive the blessings of these sutras by contributing to this fund. The cost of the ongoing work on the Prajnaparamita Sutra is approximately $25,000 per year and any additional funds will go toward writing out the Arya Sanghata and Vajra Cutter Sutras. Or simply send your check in US dollars payable to FPMT Inc. and write “Prajnaparamita Project” on the memo line. The Prajnaparamita Project is a project of FPMT Inc. All donations made to the fund are tax-deductible within the United States in accordance with IRS Code article 501(C)(3) to the extent allowed by law.